Storing defensive firearms for home defense can be a complicated balance between accessibility and safety. 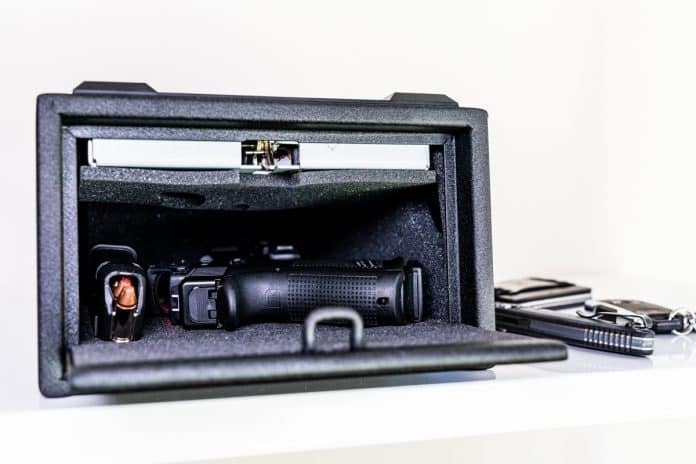 This article explores the optional conditions of ready for these guns along with the use of modern quick-access safes for secure storage, yet quick deployment. There has been, and remains, a debate that occasionally crops up among certain folks in the gun world concerning the viability of carrying a concealed handgun with nothing in the chamber. The entire population of those in the know clearly land on one side of the argument: if you carry a handgun without a round in the chamber, you are doing it wrong. The storing of home defense firearms is a very different conversation than a weapon that is carried on your person because the gun is simply, well, not on your person. A stored home defense gun that you are not wearing will be less accessible to you no matter where or how it is kept. Two caveats I will mention from the beginning are these: first, I am a proponent of carrying a gun at home since the only gun you can guarantee that you will have accessible during a home invasion is the one that is actually on you. Second, I think any gun that is not on you needs to be secured with some sort of locking device or quick-access safe. I simply cannot advise having unsecured guns in the home, even for those without children. I have found that people who leave loaded guns laying around in the house and say they never have children in the home are likely to make a mistake at some point. When company comes over with children or even negligent adults, the guns often fail to be put away because securing them is not a habit. Similarly, those who leave loaded and unsecured guns in the home often leave home without locking them up. Arriving home to face a criminal now armed with your own weapon is hardly ideal. Therefore, this discussion will involve the use of home defense handguns or long guns that are secured in quick-access safes or some other means. Going on the assumption that the gun is locked up, how should we store a home defense handgun? I would offer that, if the gun is indeed stored in a secure handgun safe that provides quick access, yet denies unauthorized access, then keeping the gun chambered is entirely feasible and safe. The argument will be one of preference as many prefer to keep any gun that is not currently on their person unchambered. There is also a compelling argument put forth by some that the additional step of running the slide to chamber the gun is a good thing considering that a home invasion may happen when you are dead asleep. Coming out of deep sleep and reacting to a situation is not ideal, but a possibility. Upon responding to a door being kicked down or a window being smashed the act of retrieving the weapon from the hand safe, as well as racking the slide to chamber the first round, takes slightly longer but will go further to ensure that you have your wits about you. I would submit that the greater importance regarding keeping the home defense handgun chambered or unchambered is based on the individual home defender’s force-of-habit. Some prefer to keep any gun that is not actually on their person unchambered. This provides an extra level of security, and I can’t argue with this. However, if you do keep the handgun with an empty chamber, yet your concealed carry gun is chambered, you must fully implement in your mind that when you pick up a gun that is not on your body, you need to run the action. There is not a great downside to this, but it needs to be a consistently practiced habit. As a personal preference, I like to keep my dedicated bedside handgun chambered and ready. The gun is always kept in a quick-access safe, and the safe provides the security needed against unauthorized access. My line of reasoning is that, just like my gun worn on my hip that is always chambered and ready, if things go bump in the night I want my go-to handgun to be chambered and ready. My carry gun is also kept chambered all the time, even when I don’t carry it. When I take the gun off, I put the entire gun-holster combination in its own quick-access safe. Therefore, I have the consistent habit of all go-to defensive handguns being chambered and ready, yet secured from unauthorized access. I will also offer this for your consideration: if you have a partner or other authorized home defenders in the home that are not particularly well trained, leaving a home defense gun unchambered now introduces another step that the person needs to accomplish before bringing the gun into action. If a minimally-trained individual might need to access the weapon, having the confidence that the gun is ready may be important to them. This is yet another aspect of this discussion to ponder for your own situation. Concerning long guns that are stored for home defense, I think that “cruiser ready” is the ideal state of readiness for rifles or shotguns. Cruiser ready generally refers to a gun that has a loaded magazine but an empty chamber. Like a handgun, the defensive long gun should be secured in a safe or one of the wall-mounted quick-access locks. The locking mechanism should cover the action of the gun so that unauthorized people cannot run the action and fire the weapon. I have a strong opinion that defensive long guns are best left unchambered for safety reasons. Most shotguns are by design not drop safe as your handgun is. This alone warrants keeping the weapon stored in cruiser ready. While most rifle designs are drop-safe, the long gun poses some additional hazards of handling. When withdrawing a long gun from a safe or other mechanisms, there is more potential for it to snag or get hung up on obstruction. Keeping to gun in cruiser ready adds an additional level of safety. A defensive long gun, by its nature, is not as fast to bring into action as is a handgun. Even comparing a home defense long gun to a staged home defense handgun, the smaller weapon proves much more immediately accessible. Therefore, the argument for the fastest possible deployment of the long gun is more limited than that of the handgun. If the gun is, however, the sole home defense weapon on hand for multiple authorized users, you must ensure that everyone knows how to chamber the weapon safely and efficiently. Maintaining defensive firearms specifically for home defense should require a balance of accessibility with adequate security. I simply oppose leaving guns accessible to anyone who happens to find it within the home, any gun not being worn on the body must be locked up. Therefore, the modern selection of quick-access storage is the best option for both handguns and long guns. The reality remains, however, that no matter how accessible the gun is only a weapon worn on your person is immediately accessible. Home carry of at least a small handgun is the best option, but that should be backed up by quickly accessible and superior firepower.